An eyewitness caught this video of Saakashvili’s detention, according to an update on the ex-president’s Facebook page. TBILISI, DFWatch–Georgia’s former president Mikheil Saakashvili has been deported from Ukraine. Saakashvili was detained in central Kyiv and deported to Poland by the border guard service. Earlier Monday, the former deputy prosecutor general of Ukraine Davit Sakvarelidze and other friends of the former Georgian president and governor of Odessa confirmed that he had been arrested in the center of Kyiv by an unknown unit. 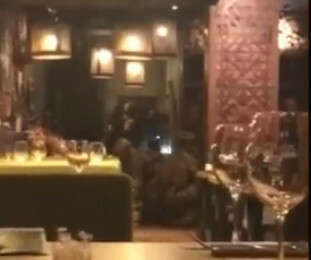 The detention was carried out inside the restaurant Sulguni, which serves Georgian dishes and is situated nearby the office of the Movement of New Forces, an opposition political party founded by Saakashvili a year ago. His supporters wrote on his Facebook that he was seized by unknown men with masks and that the ‘kidnappeers’ left the scene in three Volkswagen minivans. The supporters suspected that Ukrainian authorities would want to get rid of the former Odessa governor by deporting him to Poland. TV channel 112 reported that the readmission was made possible by a special agreement between Ukraine’s migration service applied to Polish border guard. The Georgian-born politician is stateless and entered Ukraine illegally, but the Polish border guard service has confirmed that Poland accepted him back in. Should Saakashvili be deported to his home country Georgia, he will face imprisonment for three years after being convicted in absentia for abuse of power while he was president.